I recently finished reading Sam Walton’s fabulous autobiography, “Sam Walton: Made in America”. The book should really be mandatory reading in business schools and especially for microcap investors. Sam Walton, the intelligent fanatic founder of Wal-Mart (WMT), can teach us a lot about what traits to look for in owner-operators of microcap companies. Wal-Mart went public via IPO on the OTC in the spring of 1970 at a $21.5 million valuation ($134 million: 2015 Inflation Adjusted). If you bought 100 shares in the 1970 IPO, by 1999 after 11 splits, you would own 204,800 shares. Wal-Mart ranks up there with Berkshire-Hathaway (a microcap when Buffett took over) as one of the biggest microcap success stories of all time. Even Warren Buffett acknowledges not paying up for Wal-Mart was one of his biggest mistakes. As microcap investors we want to find the next Sam Walton, Phil Knight, Jeff Bezos, Elon Musk, Bill Gates etc before their greatness is obvious. To do so we need to study these intelligent fanatics and learn everything we can about them. As investors we learn from hindsight and get paid for foresight. 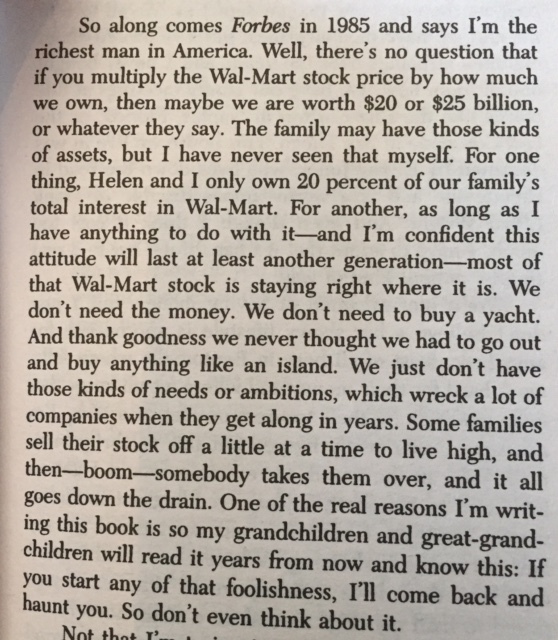 I read “Sam Walton: Made in America” very slowly, and when I was done about 20% of the book was underlined. I would be giving the book a disservice by trying to highlight all the nuggets of wisdom because there are too many. You need to read it for yourself. I highly recommend reading Made in America. If you liked this post, please read How To Find Intelligent Fanatic CEOs Early. I have a question not related to this book. I was wondering how you determine the price to set when accumulating shares in microcaps. I’m assuming you use limit orders and set it good till cancelled, but how do you determine what price to set it at. Do you use the current market price or set it above or below? Has there ever been a case where the stock went up and never came back down to your limit price? William: Depending on the size of ones portfolio, and since many microcaps are illiquid accumulating a position can be tricky. It can take hours, days, weeks, or more. I usually have a price point I’m willing to pay up to. The price point is reflective of my estimate of expected return and my conviction level. I really enjoyed this book. Sam was definitely one of the most successful businessmen ever.